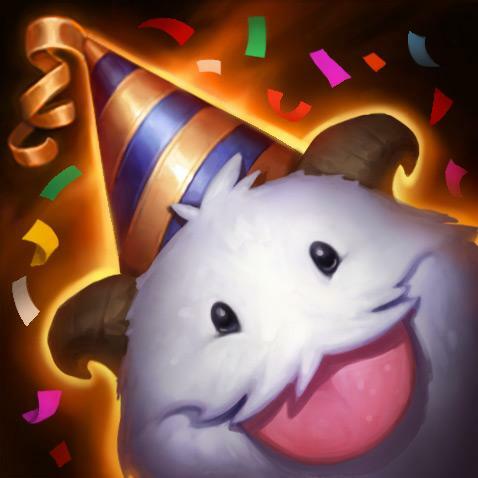 Surrender at 20: Red Post Collection: One for All in RGMQ, Incoming Scripting Suspensions, Bard's Magical Journey, and more! Red Post Collection: One for All in RGMQ, Incoming Scripting Suspensions, Bard's Magical Journey, and more! 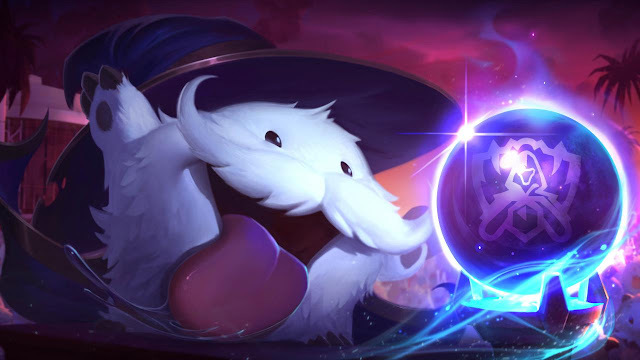 This morning's red post collection includes One for All in the RGMQ, a Bard's Magical Journey community collaboration, a note on upcoming scripting banwave, a new episode of Legends Rising, and more! 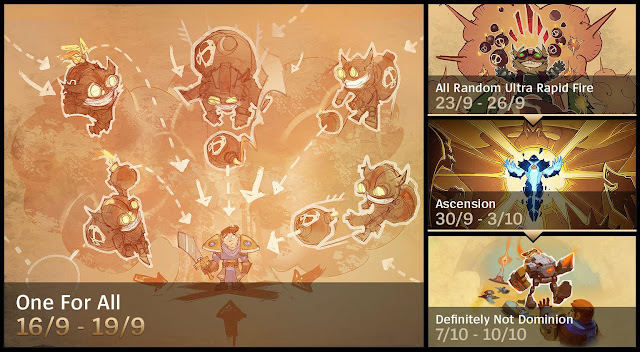 One for All returns this weekend in the RGMQ and the RGMQ schedule has been updated to include Definitely Not Dominion from October 7th - 10th. following All Random URF next week and Ascension the week after that. A new community collaboration animation is up - check out Bard's Magical Journey! "Fourteen League of Legends community animators from around the world join forces to tell the tale of Bard and his chimes. BWONG! This is just a heads up that we’re executing a fairly massive banwave on a good majority (all) of cheaters today. I know we’re normally pretty silent about this type of thing (gotta keep our enemies in the dark), but seeing as how it’s probably the 3rd largest salt mine I’ve ever excavated, I figured we’d give a little advanced notification. I’d also like to cunningly make use of everyone’s eyeballs as a reminder that we’re definitely not into applications that provide measurable player advantage. The cheating we’re targeting here is primarily comprised of modifications that take actions on your behalf (affectionately called scripting), and that’s our least favorite type of mojo. It’s probably been said before, but this is meant to be a fair videogame and you shouldn’t ever have to go digging for add-ons just to stay competitive. We've got a lot of work to do in preventing this behavior from occurring in the first place, but rest assured, the banhammer won't stop swinging until the message really sinks in. TL;DR - Bans for days. Stop scripting. Thanks!" 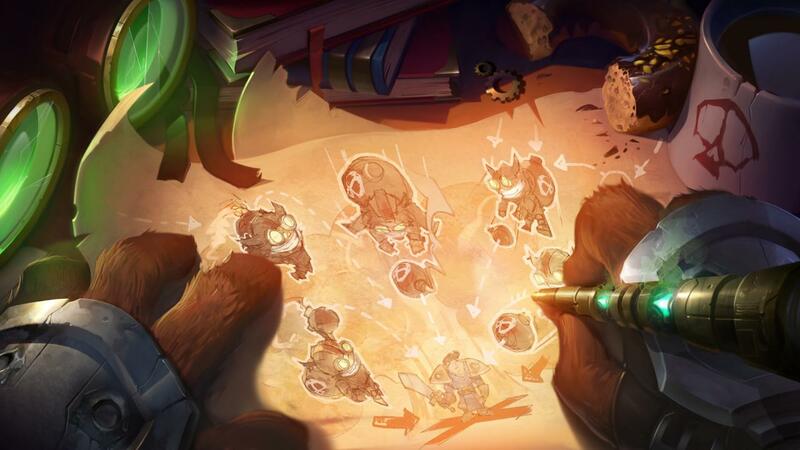 When asked if there were any specific plans for Heimerdinger in preseason, Meddler dropped off a few comments including preseason plans for banner Command. "Oh, hey, good to talk to you again! Hope LeagueFest treated you well? We don't have any specific plans for Heimer in pre-season. Banner of Command I can talk about a bit though. Current plan is that some form of Banner of Command will still exist, just without the aura. I'd expect its stats to be about as appealing to Heimer as the current ones are. That could still change of course, we're still partway through pre-season development, that's where we're up to now at least though. In terms of split push that's a style of play we do want in the game. When we've made it pretty ineffective the game's lost a fair bit of strategic depth. At the same time though we're constantly trying to find ways to make sure it's an interactive and interesting approach. Some types of split push hit that well (e.g. a champion you can send one of your team to duel who you'll fight or be able to catch like Nasus), some don't (e.g. champs who'll just disengage and never engage with you like Shaco often does, or champs who constantly push, rather than having windows you can take advantage of). Improved visibility on Heimer's passive, at least for the Heimer player, seems like a great addition. We'll add that to a backlog of work and probably get it in at some point. Probably Heimer only healing text and visual effects on a heal every 5 seconds or something rather than a constant aura effect (same gameplay, just with a bit more concentration and visual support). Regarding healing towers that's something we've generally wanted to avoid, given its potential to lead to long, stalled out games. It's a really unique space, so would be cool to find the right way of delivering on it, would want to make sure we had a fair bit of time to try different directions if exploring that idea." "It's mainly a way of giving Kass increased access to his E in busy team fights versus in solo situations. As a secondary benefit it also has some soft impact on which enemies Kass is a good choice against, though overall other factors are more important in determining which lanes are good/bad match ups for him." But that doesn't matter because it already has a standard cooldown anyway. One of those would make it so Force Pulse feels like Kassadin benefits from the stack mechanic, rather than it being a power gate. Yeah, it's a power gate. We could make a number of changes that would make it feel better, be more effective when used well. The issue there is that we don't have room to buff Kassadin. His core thing is his repeated blink, that has to sap a lot of power from the rest of his kit in compensation." "I remember we specifically didn't use the crit and made a special "E second hit" anim to make it flow better - get that 1 2 3 feel when you use it well. Feedback is feedback though, so I'll take another look at it in game and see if there's a good reason to change it to crit." "The season is not turning out as Chawy had hoped. After AHQ faltered in the Spring Playoffs, losing to Flash Wolves and missing MSI, Chawy finds himself in fighting to retain a seat within AHQ’s starting lineup. Meahwhile, Rekkles is given a new hope as Fnatic's former captain YellOwStaR rejoins the roster and Smeb has a rocky start to his summer split. Will the new developments derail their progress towards Worlds? Legends Rising Season 2 follows six of the game's greatest pros through the hard work and sacrifice necessary to achieve greatness, in a six-part series. Do they have what it takes to become a legend?" "In a few weeks, 16 top teams will begin the journey toward the Summoner’s Cup during the 2016 World Championship. 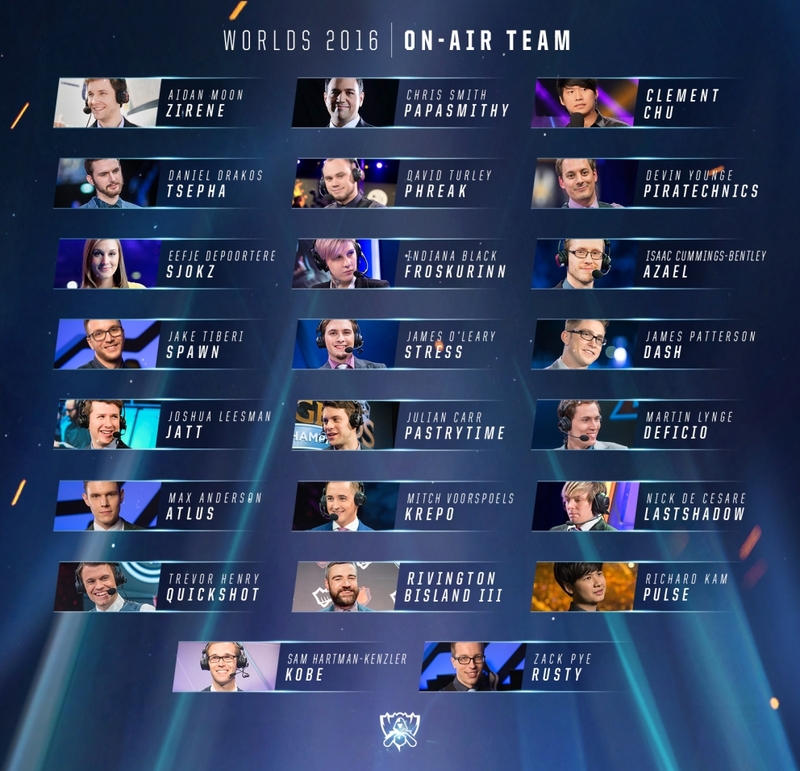 Our English language broadcast team will be on-site to cover all of Worlds 2016 action as the tournament travels across North America. We’ll have guest spots for pro players, coaches, and former pros to join us at the analyst desk throughout Worlds 2016. Tune in on Thursday, September 29 at 4:00 PM PT to catch the opening ceremony followed by North America’s Counter Logic Gaming vs. Europe’s G2 Esports. Don’t miss a chance to join us in San Francisco,tickets are still available for the Group Stage. Here's a new /ALL CHAT with the crew visiting University of Califonria and Triton Gaming Expo! "All Chat heads to the University of California at San Diego and hits up the first ever Triton Gaming Expo, organized by UCSD’s uLoL club. We join UCSD student Lulu as she explores the expo, checks out the tournaments and artists’ alley, and hangs out with Triton cosplayers. Want to learn more about events and clubs on your campus? Register for uLoL!"